When I can’t decide what to cook, a good solution is always to fuse together two of my favourite foods. Pizza + quesadillas = pizza quesadillas. 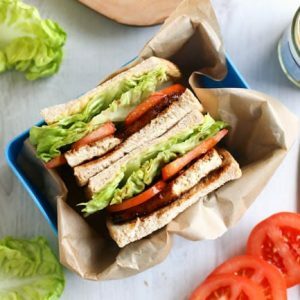 Sandwiches + Greek salad = Greek salad sandwich. Chilli + macaroni cheese = chilli mac. It’s a winning formula. 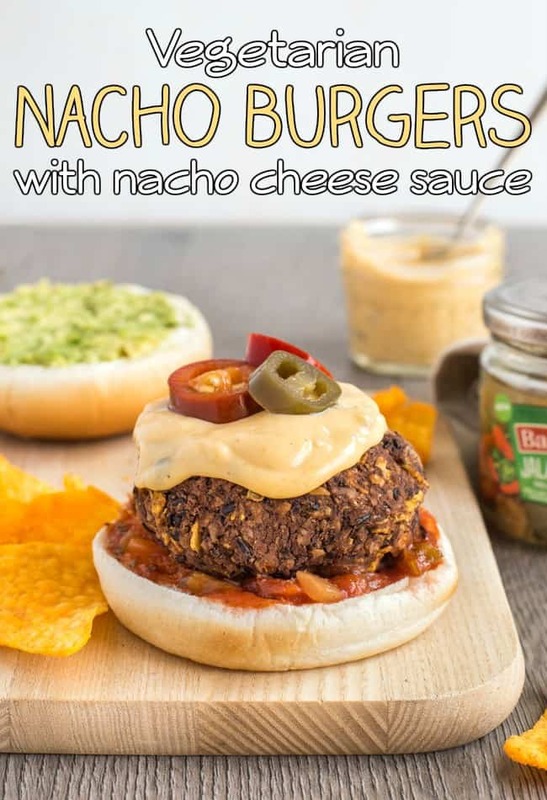 This time, I decided to combine the flavour of a plate of loaded nachos with the form of a veggie burger, and thus, these vegetarian nacho burgers were born. 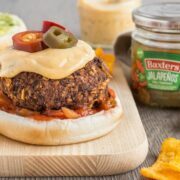 The nacho burger itself is a simple black bean burger made with black beans (obviously), walnuts (or whatever other nut you fancy), jalapeños, and – to add to the nacho vibe – some crushed tortilla chips. I used cheesy ones, which added a great flavour. Once you’ve cooked the burgers, the only thing that’s left is to get topping! 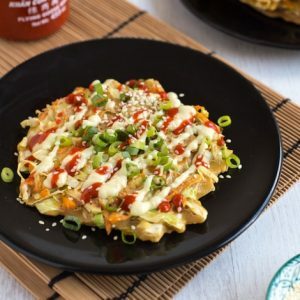 I slathered mine with a homemade nacho cheese sauce, which is basically just a béchamel sauce with added jalapeños, cayenne and American cheese – the kind that comes in slices wrapped in plastic. 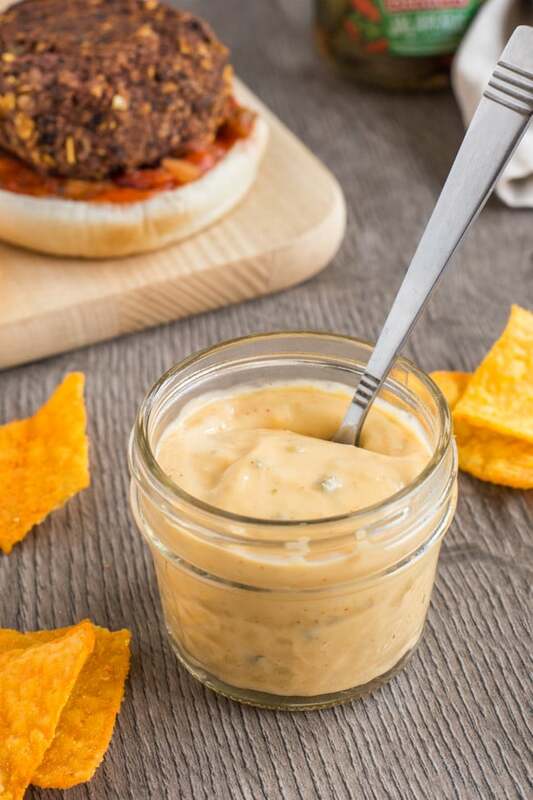 It’s not often I use American cheese, since, let’s face it, even calling it ‘cheese’ is a bit of a stretch – but it does make a seriously good nacho cheese sauce. 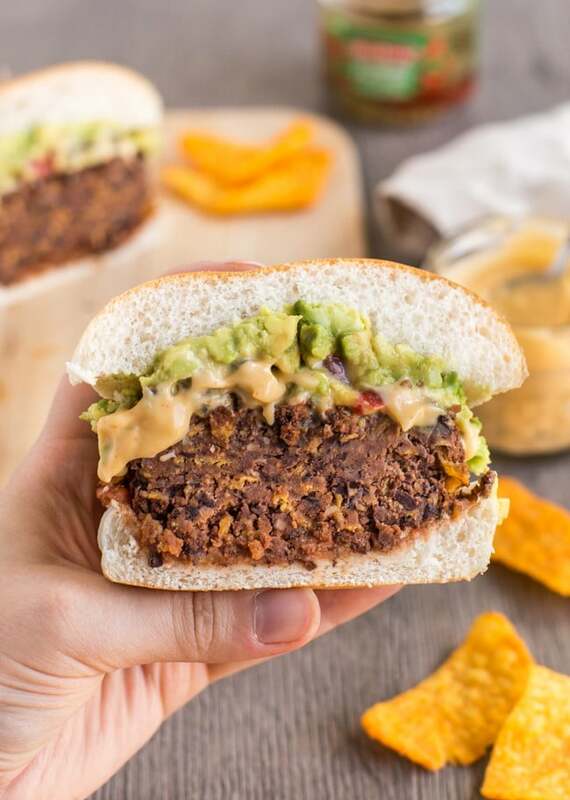 I also topped my nacho burgers with some of my other favourite nacho toppings – avocado, salsa, and more jalapeños. Yes, even more jalapeños. I thought the amount of heat was just perfect, but if you’re a bit of a wuss when it comes to spice, feel free to tone down the jalapeños or skip the cayenne! I used these pickled jalapeños from Baxters – the third item in their new Deli Toppers range (see how I used the first two products in my paneer satay bowls and my cauliflower falafel wraps). They’re so convenient to use. You don’t need to cook them or even slice them up – they come in perfect slices ready for stacking on your burger. 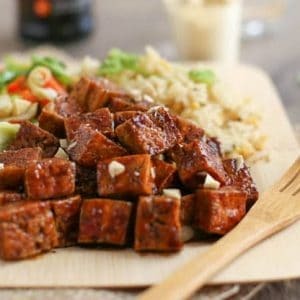 A brilliant and easy way to add an extra pop of flavour to your dinner. 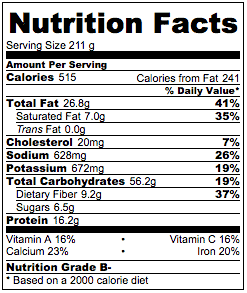 They’re also brilliant scattered over salad (taco salad especially! ), layered up in sandwiches, or whizzed up in homemade hummus. They’ve become a real staple in my fridge! Check out the Deli Toppers site for more information about the four new products and for tons of ideas for how to use them. Then just #GetTopping! Add the walnuts to a food processor, and blitz to form a coarse crumb. Add the drained black beans, pickled jalapeño slices, and half of the tortilla chips. Also add the smoked paprika and a good pinch of salt and pepper. Blitz again until well combined. Crush the remaining tortilla chips, and add them to the mixture. Mix by hand to combine. With clean hands, form the mixture into three large patties. 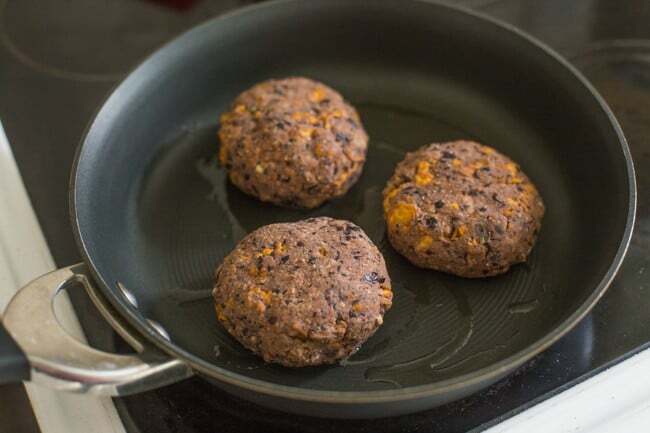 Heat a dash of oil in a frying pan, and add the black bean burgers. Cook over a fairly low heat for around 5 minutes each side, until crispy on the outside and piping hot in the centre. You can cover the pan with a lid if the burgers need help cooking through to the centre. Meanwhile, make the nacho cheese sauce. 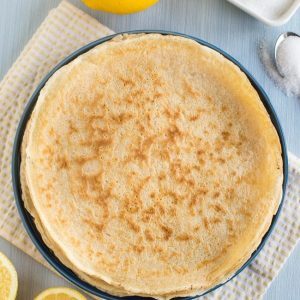 Melt the butter in a small saucepan, and add the flour. Mix well to form a roux, and cook for 1 minute over a very low heat. Add the milk 1 tbsp at a time, stirring until the mixture is smooth each time before adding more. When the mixture has formed a smooth sauce, add the chopped jalapeños, American cheese and a pinch of cayenne pepper. Stir thoroughly until the cheese has melted and formed a thick cheese sauce. Season to taste. 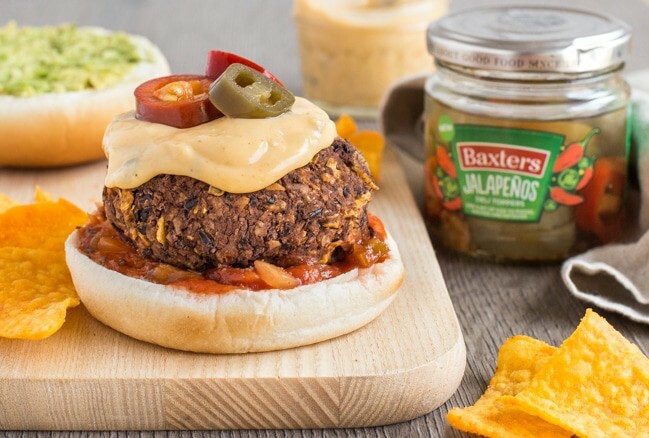 Assemble the burgers in buns with the nacho cheese sauce, salsa, mashed avocado and more slices of jalapeño. 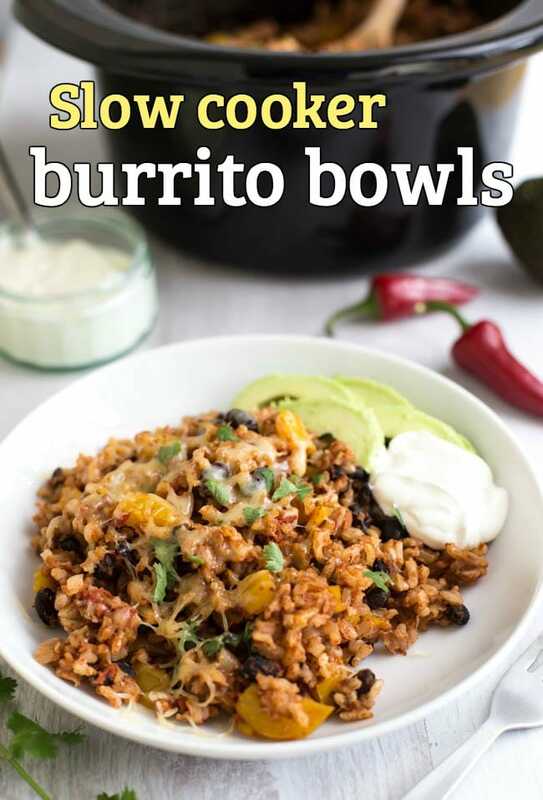 These jalapeños would also be brilliant served on top of my slow cooker burrito bowls – one of the most popular recipes on the site! oooh… I am excited to make these. And my husband is excited to eat these! 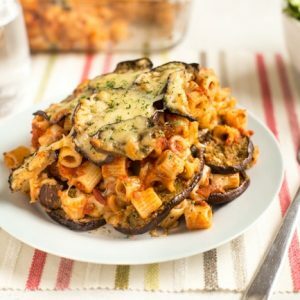 Im gonna make minimalist baker’s vegan eggplant cheese for this as I need to use up an eggplant I have and would be so perfect with this. 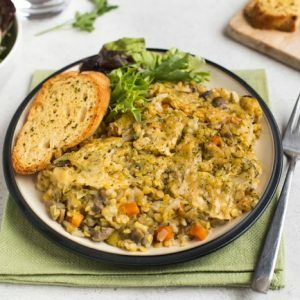 Thank you for the recipe, its nice to have something different for dinner, and this is definitely different! What a lovely combination of ingredients, the burgers look absolutely delicious. Oh my goodness! These look absolutely amazing! I need to try them this weekend. That cheeeeesseeee! I so should not read your blog posts on an empty stomach, Becca – I’m sure my neighbours can hear my tummy rumbling now! Your burgers look so delicious – do the nacho chips stay crispy, or go a bit soggy? Oh, and I am totally a wuss when it comes to chillies! These look fantastic! Loving those Baxters toppers too. Yum! Only recently started eating jalapeños. Can’t get enough of them! Good Lord what are you trying to do to me?!!!!! 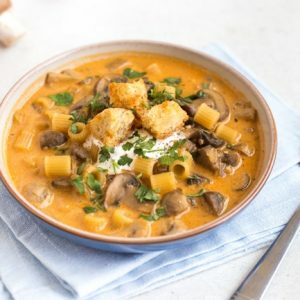 I am having to very hastily rearrange my menu plan and shopping list this morning so I can attempt to make these beauties for our Saturday night TV dinner… just too good Becca, you’ve outdone yourself! That looks AWESOME Becca. DROOL!!!!! Love home made burgers and the toppings really make them. Pinned, tweeted, yummed, flipped and stumbled, oh yeah! I love the combination of the flavors of the “burger”!! Looks delicious! I love all the flavors you have going on here! While not a vegetarian I will take these any time. They look amazing! These look and sound amazing – what a clever idea to add cheesy nachos to the mix – I love their flavour.